The full, gritty details are below. We collected our first price point in December 2006. At that time, VGPC wasn't even a glimmer in our eye. Collecting prices was an internal JJGames project to try and get a better idea what used games were worth. After using the data internally, we realized that others might want to see it too. When we launched VGPC in November 2007, we used the same pricing algorithm we had used from the start: an average of Half, Amazon and JJGames prices. In February 2008, we started collecting eBay prices and added them to the average. The following month, we recognized that using an average was inaccurate in many cases. We asked an economist friend for an easy way to improve the system. He suggested a two-tiered algorithm using the median price for products with 3 or more price points and the minimum price for products with 2 or fewer. We've used that algorithm for the last 30+ months, although the minimum rule rarely triggered. In October 2009, we started discussing ideas for a more flexible pricing algorithm that adjusted itself to market conditions common with used video games. For example, there are lots of games that only sell a few copies each year. Other games sell dozens every day. Most games are somewhere in the middle. We wanted an algorithm that did "the right thing" for each of those classes of games to give the most accurate prices we could come up with. Here's an explanation of how we achieved each of the main goals. One of our first goals was to give JJGames prices a much lower weight than eBay, Amazon and Half. JJGames does a much smaller sales volume than those three. It's also not a consumer-to-consumer marketplace like the others. The new algorithm only considers raw sales data from JJGames (never listing prices) and mixes those sales directly with eBay and private sales. We plan to add true sales data from other sources in the future. The net effect is that a single sale on JJGames contributes substantially less than 1% to the final price of a game on VGPC, on average. This change has caused the VGPC price of some games to decrease which we think puts them closer to market value. Our second main goal was to price rare games more accurately. We're big fans of the rare game market and were disappointed that our site sometimes messed up when pricing rare, collectible games. Communities interested in artwork, baseball cards, Stradivarius violins and rare video games tend to price rare collectibles based on the most recent sale. For example, there's only one copy of Nintendo Campus Challenge 1991. The last time it sold was for $20,100. Our old algorithm priced it at $14,000 which is obviously wrong. The new algorithm prices it correctly. The trick was deciding when a game was rare enough to qualify for this algorithm. Some games have a low sales volume, but are readily available on Half or Amazon. We decided that a game averaging less than 1 sale per month with no available retail listings would be eligible. Currently about 4% of used games and 7% of brand new games are priced this way. Games that sell dozens of copies in a single day offered an exciting opportunity during the redesign: statistically significant market prices. In internal discussions, we had often wondered whether it were possible to have objective confidence about the prices we calculate. For most games it's not currently feasible, but for some high volume games it is. This technique is only used for about 1% of prices (both used and brand new), so we won't belabor the details. The end result is that we're 80% certain that the price we calculate for these games is within 10% of the "true" market price. We also dynamically adjust between one, three, seven and fourteen days worth of sales to balance accuracy and recency. We choose the most recent sales data for which we can have the necessary confidence. calculate the median of these three values. It's worth noting that we do not include GameStop and JJGames listing prices in this algorithm. Those sites are retail venues with prices set by a single decision maker. Amazon and Half prices are established by a market interaction between buyers and sellers. Although considering listing prices is not ideal, they're included because many games have lots of listings and the lowest list price is close to the sales price. Specifically, the list price is typically within 6% of the sales price. Unfortunately, there's not always enough data to estimate a game's price at all. About 7% of used games and 20% of brand new games are in this category. As we continue to collect more sales and listing data, these percentages should decrease. While reworking the pricing algorithms, we also made some substantial architectural changes to our site so that we can handle higher sales and product volumes. Many of you have asked us to add all Mac and PC games to our list. These architectural changes were the last major hurdle holding us back. We've spent a lot of time thinking about, implementing, testing and adjusting these algorithms to produce accurate prices. Our goal has been to make prices that are useful for gamers and small game stores. We're very much interested in adding new pricing algorithms based on your feedback. What do you think about the new algorithms? Video game publishers have started including downloadable content (DLC) activation codes in some new releases in an attempt to discourage the purchase of used games. When sold new, games like Mass Effect 2 came with a code that would allow you to access downloadable content for the game. If you bought the game used you can still access this content by paying $15. 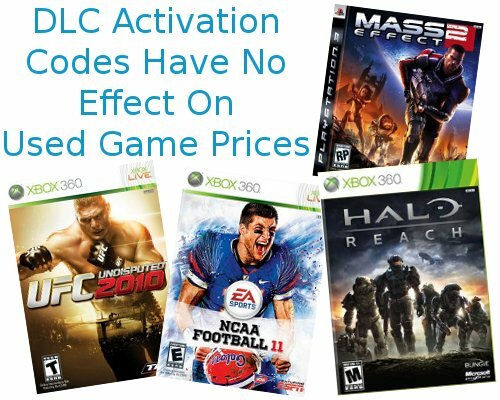 Publishers like THQ, Electronic Arts and Microsoft have started using the DLC Activation codes in all their new games but has it affected the used game prices? Are gamers less likely to buy a used game when the new version includes extra content? If activation codes are having the publisher's desired effect, there should be less demand for the used games and they should decrease in price quicker than games without activation codes. The data above shows the average game with a DLC activation code decreased in price $0.28 per day while similar games released without activation codes decreased $0.31 per day. This price difference is NOT statistically significant though. The data at this point shows that the DLC activation codes do not affect the prices of used games at all. The prices still decrease at the same pace and consumers are probably not discouraged from buying the used games. Publishers might make more money on the deal though because they are able to sell downloadable content to some of the used game customers. If even one buyer of a used game purchases the DLC for $10, the publisher made more money on that sale than they would have for a regular used game and I bet a pretty good percentage of customers end up paying for the DLC. We compared fourteen games released in 2010 with DLC activation codes to their previous games. For 2010 releases, we looked at the price change from the release date to September 23rd 2010 and divided the total change by the number of days the game was out. For older baseline games we calculated the price change from the release date to a date the same number of days from release and calculated the price change per day. For example: UFC Undisputed 2010 was released on May 25th, 2010 at $59.99. On September 23rd, 2010 the PS3 price was $24.75. The total price decrease was $35.24. Sept 23rd is 121 days after May 25th so the price decrease per day is $0.29. UFC Undisputed 2009 was released on May 19th, 2009 for $59.99. 121 days from May 19th is September 17th. The price on September 17th 2009 was $38.47. The game decreased in price $21.52 over 121 days for a decrease of $0.18 per day. We tested the difference between the two means using a t-test for differences of two means. The p-value was .535 and needed to be below 0.05 to be significant. 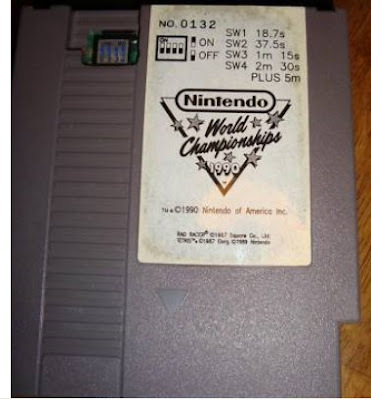 A seller on ebay has a Nintendo World Championships Gray up for auction (number 132 for those who like to keep track). Bidding is at $255 right now so it is still a bargain. Expect bidding to close around $4,000-5,000, which is the usual price for these over the last few years. The seller only has three feedback but they are all positive. If you win this, be sure to pay with an escrow service just in case. 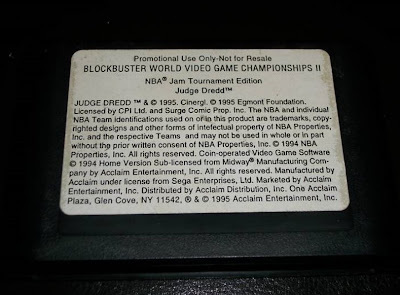 Two weeks ago I wrote about a Blockbuster Video Game Championships Reproduction that was up for sale on ebay, now the real deal is up for sale. The asking price is $12,500 with the make an offer feature available. The seller shouldn't be expecting that much considering the last sale was for $2,000 back in April 2010. If I remember correctly the condition of the sale in April was not very good so this copy of the game should sell for more than $2,000. The seller of Blockbuster Championship II has really good feedback, 3682 with 99.3% positive, so there shouldn't be any problems with the seller on this item. In the listing the seller mentions getting the game authenticated by two people at Game Galaxy in Tennessee. Incidentally, I've bought games from the owner of this arcade before. Anyone who lives nearby should definitely check it out. 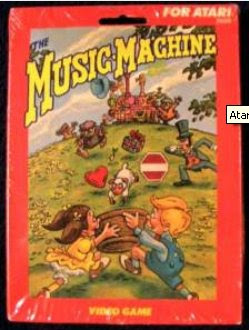 There is a Music Machine for Atari 2600 auction on ebay. The rare game sold for $5,250 last time it sold in November 2009 and bidding on this auction is already at $1,050. One word of caution for potential buyers of this game. 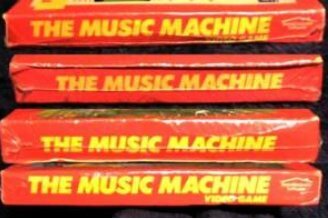 It looks like the seller has multiple sealed copies of Music Machine for Atari 2600. Here is a picture from the auction. The game sold for so much the first time because it was super rare to find a sealed copy, but if this seller found a box of these somewhere there might be another three coming up for auction at some point and potentially even more. What Would You Ask Ebay? Ebay is working with us to make an ebay video game inforgraphic. It will show all sorts of data about the video game category on ebay, but we need to know what info you're interested in. If you could ask ebay anything about their video game category what would you ask? Here are some examples: What is the most expensive game ever sold on ebay? How many Super Mario 3's have sold on ebay since it started? What is the most popular game on ebay? How many games sell every minute? They can't guarantee they have the answers to every question, but they will try to answer whatever you ask. Leave your question below and we will ask ebay for you. Hopefully we will have the answer for you in picture form in a few weeks.